Focusing the Nonprofit Board on Strategy – Same for For-Profit & Nonprofits? As directors become increasing involved in their company’s strategic process, it’s evident that some fail to have the competencies to meaningfully contribute. Some deficiencies may result in only benevolent dabbling. … But at the extreme, deficiencies can result in destructive deliberative processes and the adoption of faulty strategic decisions. Often these scenarios operate with the context of by well meaning directors – not within hostile environments. * Skill matrices related to specific director experiences are needed. But they fall short in addressing how a director might behave. Dailey presents options as to how these situations can be corrected on for-profit board by seeking directors who have seven behavioral attributes. Following is how I think the behavioral attribute mix can be applied to nonprofit boards to keeping strategic planning on the rails: “Seven (attributes) standout as key differentiators of directors’ ability to shape strategy and long-range planning“ in both for-profit and nonprofit boards. 1.Curiosity – “Curious thinkers explore far and wide, into areas that my have no obvious connection to the core” mission of the nonprofit. For example, a banker may be on the board of a hospital, with no experience in health care issues, but a curious banker can contribute to the hospital by the ability to think about the hospital’s problems in broad terms. I have often observed these types of people are staff people (such as lawyers, IT programmers and accountants) who have little management experiences and want to try to show a faux management expertise. Because they hold significant staff positions in, but many have had only managerial responsibilities for one for two people, the nonprofit’s management, staff and other directors often accepts their recommendations with disastrous results. Another opportunity is often missed by nonprofits in terms of culture. These organizations often attempt to acculturate a new director to organization instead of allowing the director to bring his/her expertise to the organization. For example, a person with financial strategy expertise is asked to overview a bookkeeping operation, instead of being asked to lead the board in developing a financial strategy. They may be what I call process people who consistently want to continually cross check everything. “Rule– lax directors… believe everything can be nuanced or ignored.” For example, I was on a nonprofit board that made a major acquisition with only the approval of the executive committee and then asked the board for post hoc approval. The results were quite costly. I resigned quickly after the acquisition with the usual excuse of having increased job responsibilities. 5. Analytical Speed – “Analysis of facts, arguments and assumptions depend upon experience and perspective, but, most important, on cognitive processing cognitive ability. 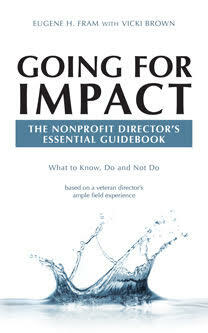 “ Nonprofits boards need more of this type of director but they are in short supply for for-profit and nonprofit boards. 7. WHO TAKES THE LEAD IN THE NONPROFIT WORLD? “Board engagement is fine, but overall the consequences for (nonprofit boards like for-profit boards) are not all positive. “It is the job of the nominating committee to seek diverse (behaviorally based) candidates on “who we need” rather than “who is available” criteria. ← Once Again: How to Keep a Nonprofit Board Informed.